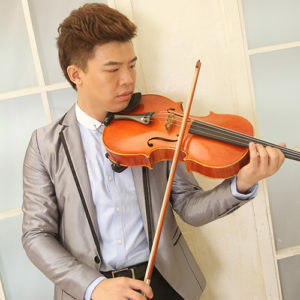 A native of China, Wenguan Li graduated from the Middle School affiliated with the Central Conservatory of Music in China, where he studied with Shaowu Wang. He went on to earn his bachelor’s and master’s degrees at the Mannes College of Music in New York, where he is currently pursuing his PDPL Diploma as a full-scholarship student of Paul Neubauer. Mr. Li has been a prizewinner at the Washington International Competition, Villade Llanes International Viola Competition, Hudson Valley International Concerto Competition, Mannes Concerto Competition, Morningside Music Bridge International Academy Concerto Competition, and China National Viola Competition. As a soloist and an orchestral performer, he has appeared at numerous venues worldwide, such as Carnegie Hall in New York, Alice Tully Hall in New York, Symphony Space in New York, Kennedy Art Center Chamber Hall in D.C, Gdansk Concert Hall in Poland, and Beijing Concert Hall in China. Mr. Li currently plays on a 1916 Leandro Bisiach viola.